From the NHL’s most unexpected All-Star MVP comes a sports memoir unlike any other. 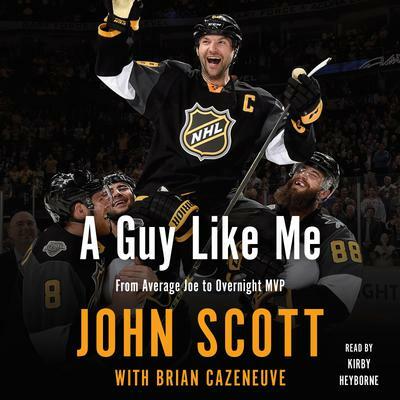 Hilarious, candid, and reflective, A Guy Like Me recounts the heartwarming story of John Scott: an average joe who became a sports superhero overnight. Known as a willing-and-able fighter and bruiser in the league, John Scott was a surprising and tongue-and-cheek nominee for the 2016 NHL All-Star Game. He’d been in the league for over eight NHL seasons, playing for teams such as the Wild, Blackhawks, Rangers, Sabres, and the Sharks. Scott’s best attribute as an NHL player was dropping his gloves—never the best player, the 260 pounder did become the most feared fighter in the NHL, racking up extensive penalty minutes. In order to prevent him from playing in the game, his current team—the Phoenix Coyotes—traded Scott to the Montreal Canadians, who demoted him to the AHL team in an attempt to disqualify him from playing in the All-Star Game. Fans were outraged and Scott was devastated. He’d been downgraded in his job—forced to relocate while his wife was pregnant with twin girls. But the fans wouldn’t back down and insisted the NHL let Scott play in the game. The league relented, and Scott not only was invited to attend the NHL game in Nashville, but was nominated a team captain. The media and sports fans at large fell in love with the giant six-foot-eight player who by all means, was just a normal guy and no superstar player. In a true Cinderella story, Scott scored two goals and was the All-Star Game’s MVP. This is his personal memoir—detailing his life growing up and how he was able to keep his sense of humor and become the ultimate Cinderella-Story of hockey.